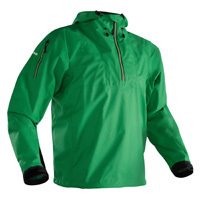 When conditions change, the NRS High Tide Jacket provide the perfect protection from wind, splash and rain. Works great as a splash jacket and a rain jacket. Half-zip entry that makes it easy to put on in the boat and allows efficient ventilation. The articulated hood has three adjustment points for a snug, windproof fit and a flexible bill to keep the drips off your nose. Made from lightweight HyproTex™ material that provides waterproof-breathable protection while being flexible for paddling and easy to stow. A generous splashproof sleeve pocket provides accessible storage even when you're wearing your life jacket. Adjustable hook-and-loop sleeve cuffs help block spray and paddle drip. Zipper Pockets on both sleeves for those items that you need close at hand. Elastic Bungee secures the waist and a silicone grip keeps it in place.